As you most likely already know, Porsche is celebrating its 70th birthday this year and is honouring the occasion with various events worldwide, including being the featured marque at the Goodwood Festival of Speed. Not content with just partying around the world, they have also decided to inject the revelry with an actual vehicle, but not just any vehicle, an open-top Speedster Concept based on the 911. It is, in effect, a lightweight, roofless GT3 based on the 991.2 Carrera 4 Cabriolet. The windscreen has been shortened and tilted at more of an angle, while the side glass has been narrowed to fit. There is a 'double bubble' carbon fibre panel behind the cabin – this isn't there to hide away a roof, because there isn't one – rather, it covers the roll-over structure, and has an engraved plexiglass wind deflector that says ‘70 years of Porsche’ between the bubbles. If you do insist on parking in the elements, then Porsche has included a tonneau cover to keep the water out. And there's no point using it to keep thieves from stealing the radio because there isn't one of those either. In fact, in homage to the original homologated 356 'No.1' from 1948, there's no sat nav or air conditioning either but you do get to put your bum in one of two uniquely crafted carbon fibre bucket seats. Carbon fibre composite is used for the wings and bonnet too, while under that retro-inspired skin lies the important bits of the current GT3. This includes the 493bhp 4-litre flat six attached to a six-speed manual gearbox sitting on the full GT3-spec chassis. With no official figures released yet, including its weight which is likely less than its donor siblings, we can surmise that it's likely very, very fast. Porsche have worked hard on making the Speedster instantly recognisable with a large focus on unique detailing. From the 21” Fuchs-style wheels with a centre lock design to the 50’s-style fuel filler mounted on the bonnet, as well as the ‘Talbot’ exterior mirrors, it's simply stunning. The inside has received the same attention to detail with light brown leather trim called ‘Cognac 356’, and a milled, gold-plated Speedster logo positioned on the B-pillar. Even the headlamps get special treatment by using opaque and transparent surfaces to achieve the ‘crossed’ effect, that is, to give it the effect of taping the lights for protection like racers of the era did before the start of a competition. Porsche is ‘offering a glimpse of a potential series production version’ which may appear in 2019, but a final decision will be made in the next few months. The Speedster will likely land at certain showrooms, and if so, we expect a very limited production. 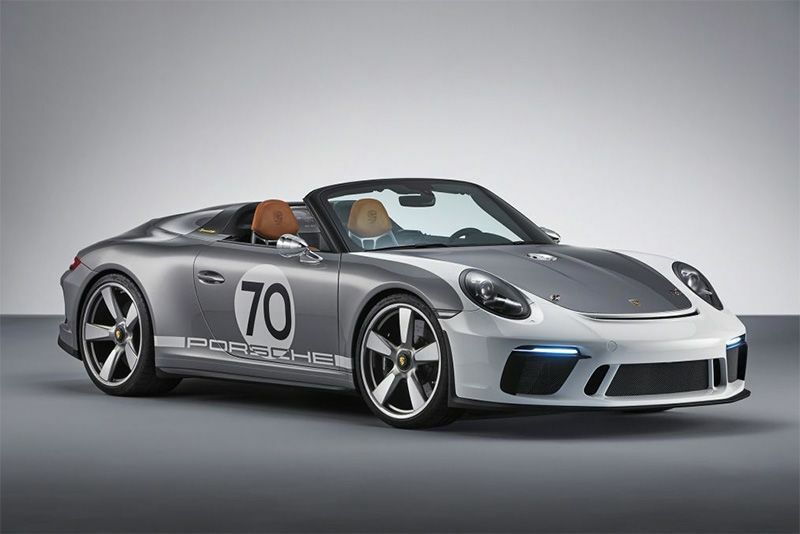 Let us have your thoughts, what do you think of Porsche's retro Speedster?